Many educators and psychologists have described various stages through which a child develops. Probably the most well known is Piaget, but Bruner, Erikson and Steiner are others. The stages of development described by Erikson, Piaget and Steiner indicate areas of agreement. These stages are accepted by educators. The problem is that the major educational decisions are made on a political basis not an educational one. Also that the people making these decisions ignore the findings of these respected figures who have made their life study how we grow and develop. The second question, “What is taught?” requires content or curriculum. If we accept the stages described by Bruner, Erikson, Piaget and Steiner it follows that we should formulate content which is appropriate for each stage of development. It follows that the appropriate time for teaching subject areas is determined by the stage of “all round development” (which includes both affective and intellectual understanding), and not simply by the stage of cognitive development. Some of this is based on an examination of the personality or temperament of children and teacher, and encourages teachers to prepare their lessons so as to appeal to children of different temperaments. Some is based on the acknowledgement that a child is not a miniature adult, but lives in a world which has a unique quality. Teaching therefore needs to follow a path through this world, starting in the imaginative and creative realm, moving to action and practical expression, and finally reaching the cognitive. In doing so it is a methodology which takes into account left and right hand brain activity. What is the essence of geometry? It is form, symmetry and perspective. Children possess a natural feeling and understanding for these things. This understanding is taken as the starting point for the teaching of geometry and the aim is to awaken and nourish these qualities. Why not start the teaching of geometry by encouraging the drawing of very simple forms at a very early age. The forms can begin quite simply and progress gradually so that in the lower grades the children experience straight and curved lines, the circle and other geometrical shapes, symmetry, mirror images, and metamorphosing forms. Little use would be made of the ruler and measuring, and children are encouraged to improve their visual judgement and freehand drawing. 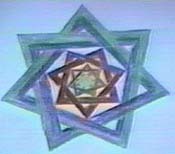 Children draw and then color in many different types of geometrical patterns and drawings. “Real” geometry can now be taught but again it will remain in the realm of observation and artistic construction; it is not concerned with measurement and proofs. For example, perhaps from ages 10 to 11 constructions can be drawn with compass and ruler, but without calculations and measurement. Geometrical “proofs” are learnt by “discovery” from the constructions drawn, namely “proofs” are visible. The teaching of the actual proofs can follow and could be taught at around age 12. Thus knowledge is built up through the wonderful experience of discovering that one’s own feeling for form and so on can directly relate to learning geometrical proofs and theorems. Through this and similar processes an important principle is established. In the first place children come to care for and understand subject matter. Later on they can learn and add the theoretical knowledge. In so doing, integration of left and right hand brain activity occurs, first through feeling and later on through cognitive understanding. Those of us involved in the raising of children know how important it is for us to set an example for our children. Children need this but they also need more than this. They need their heroes and heroines and it is a sad reflection on modern society that children look no further than pop or film stars to satisfy their needs. It is important, therefore, that through the curriculum children can study people worthy of their admiration and respect. If we accept the above stages we begin to see this need taking form in children around the age of 7 and 8, and so it is crucial that appropriate topics are introduced at this stage. In one sense children are moving from one type of consciousness to another.They pass from a world of imitation to one of pictorial representation. From a world dominated by “action orientated” behavior we find that the childs’behavior is influenced to a very great extent by the affective, namely feeling orientated. Prior to this, children’s sense of right and wrong is based, to a very great extent, on what pleases or displeases mother or other adult. At around 7 a change takes place and children start to develop an inner feeling for what is right or wrong. This is a crucial time for their ethical development and children should hear stories which stimulate their imagination.Through such stories children are able to experience two human traits or characteristics that are part of human life. These are tolerance tempered with humor and also a deeply felt reverence. These could never be understood by young children through their cognitive faculties, and yet they are intensely felt if they are experienced through the imagination. Instead of being impressed by the wealth or exploits of a current “pop star” children are stirred through their imagination by wonderful tales of courage, humility, compassion, and fortitude.